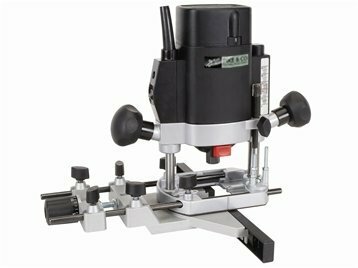 T5EB 1/4in Variable Speed Router with electronic full wave variable control of spindle speed under load for a fine finish on all types of material. Features include:- Soft-start feature eliminates sudden movement of machine on start up. Precision machined one-piece multi-slit collet with combined nut. Soft grip handles, low profile dust spout and ergonomic spindle lock. 4.6amp Standard model collet dia. 1/4inch and 8 mm Cutter dia. 9 - 27000 rpm Dust spout size.